Bioethics and design both aim at making progress in the real world. I'm fortunate to work at a place that is deliberately experimenting with the application of creative methods to knotty moral problems, whose history of invention and reinvention in the field of bioethics is a tradition I'm proud to join and attempt to uphold. EthicsLab is an innovation lab at Georgetown whose team-based approach unites people on the front lines of complex moral issues with expert bioethicists and designers to create tangible moral change. Conversations in Bioethics is an annual campuswide series we call an "anti-event" because it joins student work with expert panelists for a semester-spanning, powerful conversation about a critical bioethics issue. The KIE's six-week, seven-faculty Introduction to Bioethics online course (MOOC — massive open online course) is free to anyone in the world with an internet connection. The KIE's Intensive Bioethics Course (IBC), now in its fortieth year, draws a global audience of health care professionals, policy-makers, researchers, and others for an intensive week of bioethics with KIE faculty. Studio 105 was an experimental studio-based introduction to bioethics co-taught by KIE director Maggie Little and designer Arjun Dhillon. Students worked collaboratively and iteratively on real-world projects, including sequencing their own genomes. IDST 330 was a seminar co-taught by KIE director Maggie Little distinguished visiting professor of design Ann Pendleton-Jullian that used methods from architecture and design to tackle a concrete moral issue: medical error. Hybrid 105 was an experimental introduction to bioethics taught by Travis Rieder that flipped the classroom by using MOOC material and other online resources for lecture content, and classroom time for collaborative discussion. Our Making the MOOC blog is committed to experimentation, creativity, and radical transparency about the ins, outs, ups and downs of our foray into massive open online education. 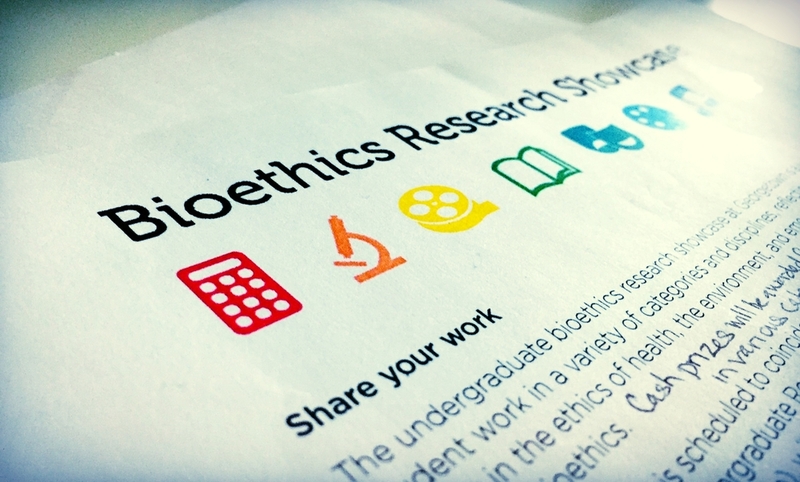 The Bioethics Research Showcase is Georgetown's first-ever undergraduate event dedicated to a broad array of research methods and presentation media in bioethics.